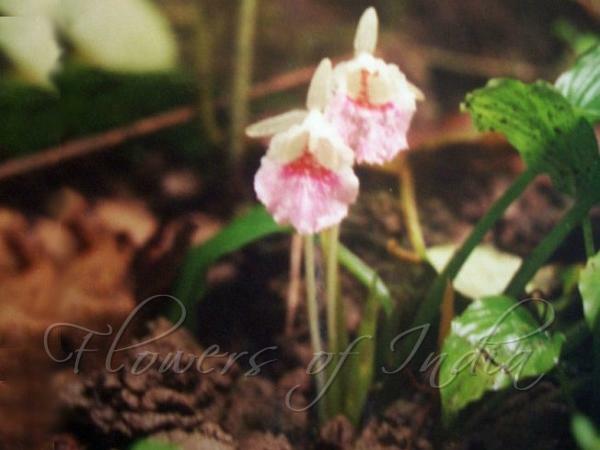 Andaman Fingerroot is an annual stemless plant with slender root-fibres. Leaves are 3 in a tuft, with 6 inches long stalk. Leaves are oblong pointed, membranous, smooth, 4-5 inches long. Leaf base is unequal sided,	sides rounded. Flowers arise singly at the end of a long slender spike. Bracts are few, narrow, membranous. Flower-tube protrudes much from the uppse bract. Segments are 0.5 inches, oblong-lanceshaped, greenish. Flowers are lilac, staminodes oblong, and the lip deeply cut into two. Andaman Fingerroot is endemic to the Andaman islands.